Italian philologist; born July 16, 1829, at Göritz, Austria. His father, who had made a fortune in the manufacture of paper, died while Graziadio was an infant. Graziadio devoted himself at an early age to the study of languages, especially to comparative philology, to which latter he became passionately attached. At the age of sixteen he made a sensation in philological circles by a comparative study of the Friulian dialect and the Wallachian tongue ("Sull' Idioma Friulano e sulla sua Affinità con la Lingua Vallacca; Schizzo Storico-Filologico," Udine, 1846)—a masterly work, considering that the subject had never before been treated, and that the boy philologist had not even a suggestion from a teacher. Ascoli thenceforth devoted himself with enthusiasm to the promotion of the study of philology in Italy; and in 1854 he founded the first linguistic journal in his country under the title of "Studii Orientali e Linguistici." The vast erudition exhibited by the brilliant editor of the two volumes that appeared between 1854 and 1855 won for him the chair of comparative philology at the Accademia Scientifico-Litteraria of Milan. There he began his "Corsi di Glottologia," afterward published and translated into English and German, and awarded the Bopp prize by the Berlin Academy. At Milan Ascoli realized his life-dream of reviving the study of languages in Italy and of reawakening the taste for the Oriental tongues, which, since the death of the two Assemani, had almost sunk into oblivion. All the philologists of any importance in Italy have been the disciples of Ascoli. He is one of the few really great pioneers that have given the study of language its present strictly scientific character; and he has left the impress of his genius on almost every branch of linguistics. In comparative philology, in the study of Oriental languages and of the tongues and dialects of Europe, in the science of phonology—in all these his richly creative and original mind, combined with an unparalleled erudition and a rare sense of penetration, has achieved brilliant and lasting results. 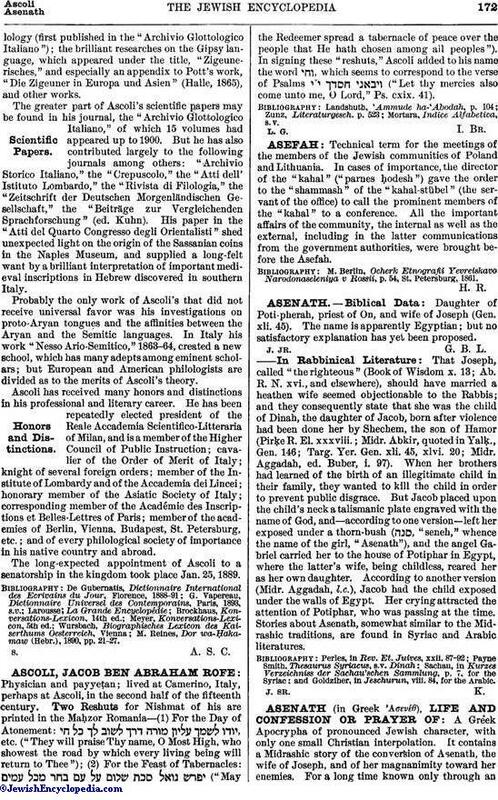 His "Fonologia Comparata del Sanscrito, del Greco e del Latino" (Turin and Florence, 1870; translated into German by Bazzigher and Schweizer-Sidler, Halle, 1872), followed in 1877 by the "Studii Critici" (Turin and Florence; translated into German by Merzdorf and Mangold, Weimar, 1878) at a time when the discussion of phonetic principles was most active—wrought a revolution in comparative Indo-Germanic philology. In particular, his distinction between the velar and the palatal gutturals—as for instance between the sounds of "kite" and "quite"—solved many of the difficulties found in the application of Grimm's law in its cruder form. Ascoli is the author of many important discoveries in the science of phonology, he having been the first to formulate many of the laws of phonetic change: both in Italy and abroad he is deemed one of the greatest authorities on all questions in this important branch of linguistics. Hardly less great is Ascoli's reputation as an authority on Romance philology; and his "Saggi Ladini" (Vienna, 1872; reprinted in vol. i. of the "Archivio Glottologico Italiano") was epoch-making in the study of Italian and the more closely allied Romance tongues, and brought forth a mass of important and valuable researches, published in the "Archivio Glottologico Italiano" founded at that time by him. Ascoli is also the author of: "Lettere Glottologiche" (Turin and Milan, 1881-86), to which the Institute of France awarded the Volney prize, and which, like most of Ascoli's larger contributions, have been translated into German (by Güterbock, Leipsic, 1887); "Il Codice Irlandese dell' Ambrosiana," edited and illustrated by himself, containing deep and fruitful researches on the Celtic tongues (published as vols. v. and vi. of the "Archivio Glottologico Italiano"); the "Saggi Indiani," an important contribution to comparative Indo-Germanic philology (first published in the "Archivio Glottologico Italiano"); the brilliant researches on the Gipsy language, which appeared under the title, "Zigeunerisches," and especially an appendix to Pott's work, "Die Zigeuner in Europa und Asien" (Halle, 1865), and other works. 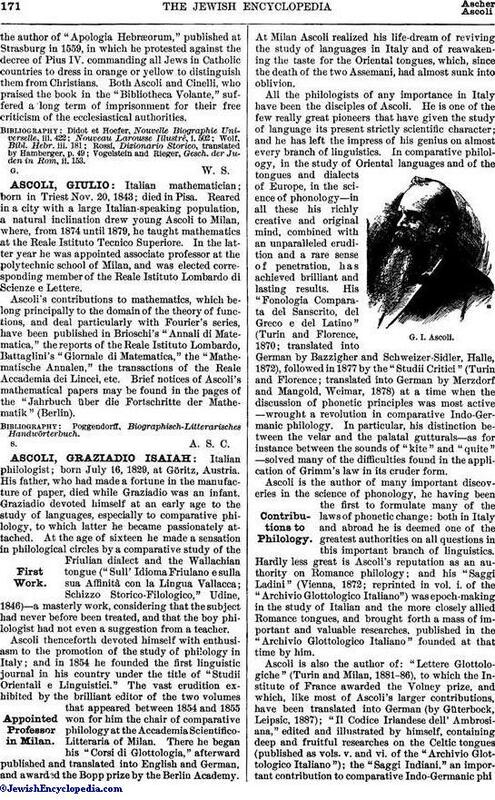 The greater part of Ascoli's scientific papers may be found in his journal, the "Archivio Glottologico Italiano," of which 15 volumes had appeared up to 1900. But he has also contributed largely to the following journals among others: "Archivio Storico Italiano," the "Crepuscolo," the "Atti dell' Istituto Lombardo," the "Rivista di Filologia," the "Zeitschrift der Deutschen Morgenländischen Gesellschaft," the "Beiträge zur Vergleichenden Sprachforschung" (ed. Kuhn). His paper in the "Atti del Quarto Congresso degli Orientalisti" shed unexpected light on the origin of the Sassanian coins in the Naples Museum, and supplied a long-felt want by a brilliant interpretation of important medieval inscriptions in Hebrew discovered in southern Italy. Probably the only work of Ascoli's that did not receive universal favor was his investigations on proto-Aryan tongues and the affinities between the Aryan and the Semitic languages. In Italy his work "Nesso Ario-Semitico," 1863-64, created a new school, which has many adepts among eminent scholars; but European and American philologists are divided as to the merits of Ascoli's theory. Ascoli has received many honors and distinctions in his professional and literary career. He has been repeatedly elected president of the Reale Accademia Scientifico-Litteraria of Milan, and is a member of the Higher Council of Public Instruction; cavalier of the Order of Merit of Italy; knight of several foreign orders; member of the Institute of Lombardy and of the Accademia dei Lincei; honorary member of the Asiatic Society of Italy; corresponding member of the Académie des Inscriptions et Belles-Lettres of Paris; member of the academies of Berlin, Vienna, Budapest, St. Petersburg, etc. ; and of every philological society of importance in his native country and abroad. The long-expected appointment of Ascoli to a senatorship in the kingdom took place Jan. 25, 1889. M. Reines, Dor wa-Ḥakamaw(Hebr. ), 1890, pp. 21-27.